If you have a missing tooth or teeth, our team will provide you with a range of treatment options. One of them is the dental bridge. A dental bridge is a suspended artificial tooth or teeth situated between the teeth on either side of the gap. 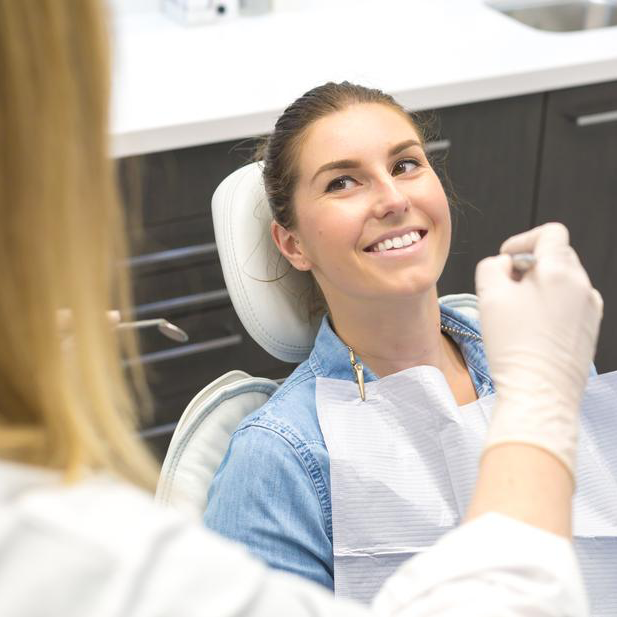 Dental bridges consist of an artificial tooth that can be connected either to your natural teeth or to implants, or even to the remaining root following root canal treatment. 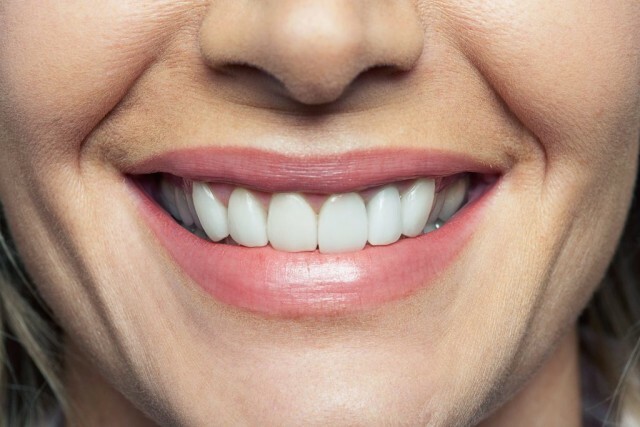 Gaps allow your remaining teeth to shift, rotate and super-erupt into empty spaces, causing malocclusion. Gum disease, periodontal pockets and bone loss around remaining teeth. Psychological issues surrounding your appearance and self-confidence, especially if the missing tooth is in the anterior region. Strengthen a damaged and fractured tooth. 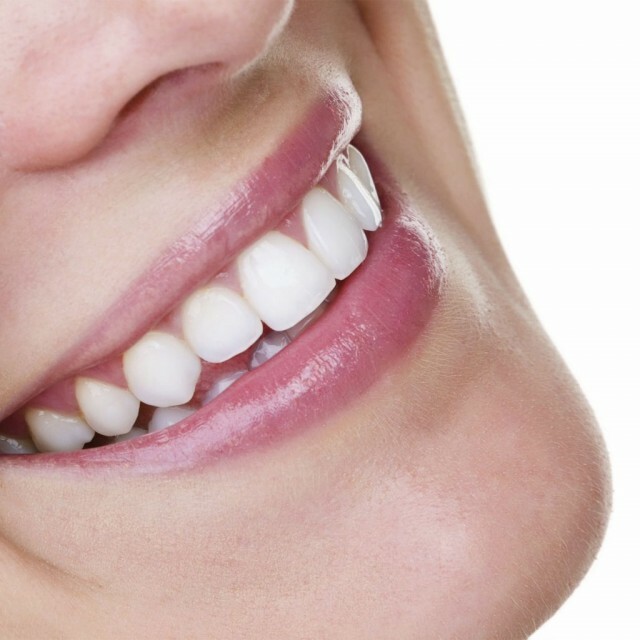 Improve shape and alignment of rotated or shifted teeth. Substitute your missing tooth in a natural-looking way with a realistic prosthetic designed to match your existing tooth shape and colouration. Prevent adjacent and opposing teeth from moving, thus preserving your bite alignment. Less bone resorption around remaining teeth and better gum health. Conventional bridge – involving connection of the suspended tooth on both sides of the gap. 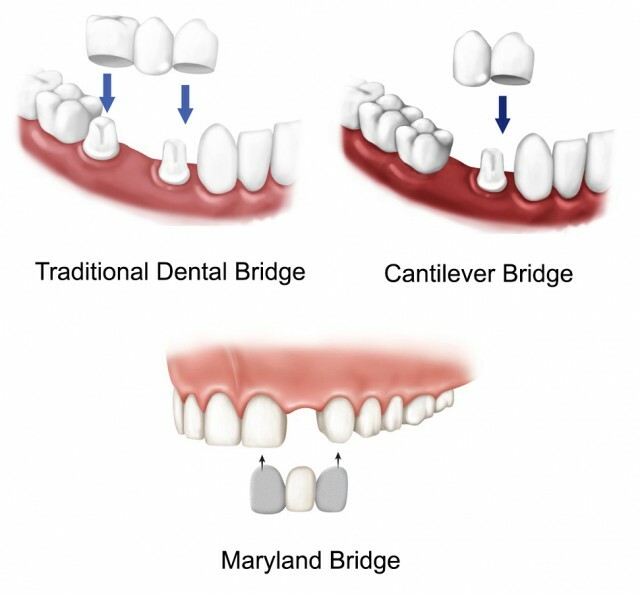 Cantilever bridge – where connection is made from suspended tooth to only one side of the missing tooth. This is used in only limited cases, as decided by your dentist. Maryland bonded bridge (Resin-bonded Bridge) – here, the artificial tooth is supported by metal or porcelain wings to your adjacent teeth. We offer a choice of materials, and will help you to decide the best option to match your budget and aesthetic requirements. A combination of porcelain and metal, or porcelain and gold. This has the high strength of metal and and the fine aesthetic qualities of porcelain. Porcelain bridges are easily matched to the colour of your natural teeth. Porcelain not only replaces the lost teeth but, due to its flexibility in design, can improve upon the original and give outstanding results. Dental bridges are usually applied in two or three visits; during the first visit, the patient’s teeth are examined and measured. Once it is decided that you will receive a dental bridge, a local anesthetic will be given and the adjacent supporting teeth will be prepared. 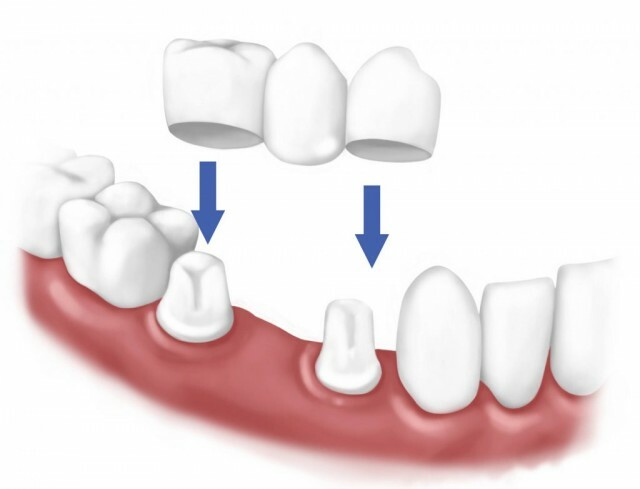 After completing the preparation, an impression is taken of the teeth in order to design and construct the dental bridge. 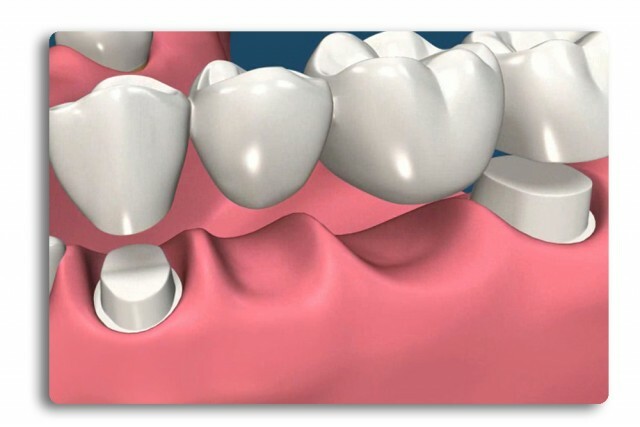 Until the permanent bridge is completed, we will provide you with a temporary bridge to protect your gums from damage. Be ready for a natural-looking smile with an effective new tooth, matching the original in both shape and shade. How durable will the bridge be? Bridges can last a lifetime, but in order to keep them in top condition you will need to maintain excellent oral hygiene. Keep your gums and teeth healthy so that the bridge will not lose its support. Avoid chewing gum or sticky foods. Brush the bridge like a normal tooth. Floss at least once a day under the bridge as well as between your natural teeth with a proxy brush, which is a very small brush designed to access small spaces between teeth. Better yet, use a threaded floss or super floss to remove plaque underneath the bridge. These are readily available at pharmacies. Our team will gladly demonstrate these steps. The use of a fluoride rinse may be a useful additional step for the patient with a history of tooth decay and gum disease. And after that, don’t hesitate to flash your new smile!